Reach out to Hawaiian culture! Be sure to check out the Hula Workshop News and Events and read Ka Leo o Ke Kai, our blog! Learn to dance the hula. Find out about Hawaiian culture. Entertain or be entertained at luaus and parties. Hula Workshop is the premiere Hawaiian dance, performance, and culture institution in Southern New England. With over 30 years experience teaching and creating shows, Hula Workshop No Ka `Oi! Visit our site regularly to find out what's going on with classes and performances. Learn fun facts and follow our creative paths and ponderings on our blog, Ka Leo o Ke Kai (Voice of the Sea). New students and audiences are always welcomed. Hula Workshop dancers bring you the real Hawai`i spirit. Whether you're learning to dance the Hawaiian Wedding Song for your wedding, booking a school demonstration, or want to study hula longterm, you get a rich experience with Hula Workshop. 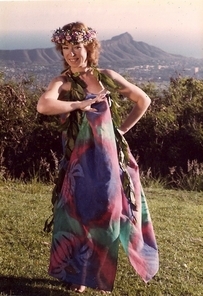 Your kumu hula (hula source), Carol Anne Buckley, lived in Hawai`i and studied for years with renowned hula masters. She teaches with a real knowlege of the Hawaiian language and culture--and with a stage-savvy sense of fun that brings joy. At Hula Workshop, there's knowledge from the roots, and knowledge that grows. He `ike kumu. He `ike lau. All material on this site is under copyright. To seek permission to copy, modify, or reuse this site's words and images, please contact us.